In November 2009 Catherine Ashton was appointed as the EU’s first High Representative of the Union for Foreign Affairs and Security Policy/Vice-President of the European Commission. 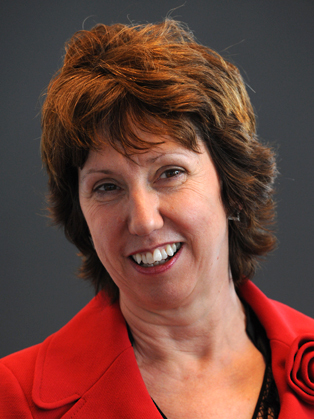 In May 2012, Catherine Ashton was honoured with the BusinessMed Blue Award. The award was presented to her in recognition of her efforts in promoting peace and economic development in the Mediterranean region. The Blue award – also known as “Mare Nostrum” - is a prize awarded each year to a personality selected by the Union of Mediterranean Confederations of Enterprises. As EU Foreign Affairs chief her portfolio includes a wide variety of roles: traditional diplomacy; coordinating other foreign policy tools – development assistance, trade, humanitarian aid and crisis response; building consensus between the 27 EU countries and their respective priorities – often through monthly meetings of EU foreign ministers – which she chairs; attending regular meetings of leaders of EU countries in the European Council; representing the EU at international fora such as the United Nations; heading the European Defence Agency and the EU Institute for Security Studies. She led major negotiations on the Free Trade Agreement with Korea, finalised in October 2009, and solved a number of high-profile trade disputes with major trading partners. She also championed trade as a means of promoting development around the world, putting the EU's economic relationship with African, Caribbean and Pacific countries on a firmer footing. She attended Upholland Grammar School in Billinge Higher End, Lancashire, then Wigan Mining and Technical College. Ashton then went on to study in Bedford College, London. She graduated with a BSc in Sociology in 1977.